A new season of free exhibitions, events and activities are taking place to celebrate early photography in Birmingham during the summer holidays. Photography enthusiasts and families alike will have plenty to see and do at a series of events for Developed In Birmingham. It has been devised by curator and photographic historian Pete James and runs from June 15 until September 3. 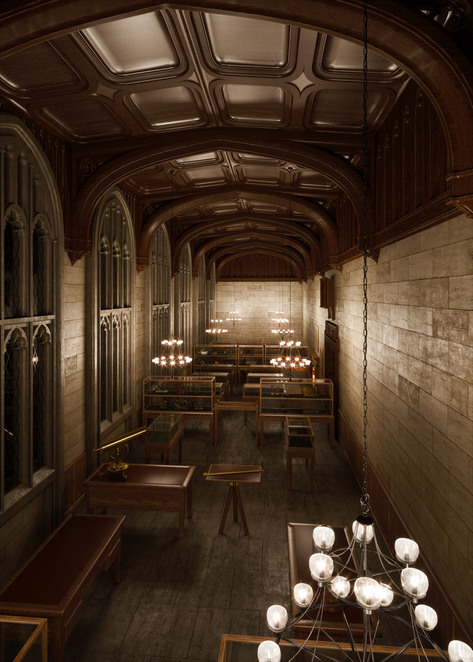 Visitors can enjoy two complimentary exhibitions; Thresholds, a virtual reality artwork by Mat Collishaw at the Waterhall Gallery in Birmingham Museum & Art Gallery and A White House on Paradise Street by Jo Gane at BOM (Birmingham Open Media). Exploring early photography in Birmingham in 1839, Developed In Birmingham also features a variety of hands-on workshops, talks, walks and events in a range of venues and public spaces across the city. It will give visitors the chance to learn about historic photographic processes using a range of techniques to create their own cameras out of re-cycled materials. There will also be the chance to hear the artists and photographers involved in the exhibition talk about their work or opportunities to join in photo walks around the city looking again at familiar places and placing them within the history of photography. Visitors can also sign up to participate in portrait sessions using antique photographic techniques. Jo Gane, Artistic Director for Developed in Birmingham said: "There really is something for everyone, from budding young photographers to established artists looking to expand their knowledge of those first processes and photographs taken right here in Birmingham. I'm particularly excited to see how people respond to my exploration of George Shaw's missing early Daguerreotype and look forward to a fantastic summer celebrating photography from the 1830s through to present day." Thresholds is one of the events that has been conceived and developed by Mat Collishaw and Pete James and involves restaging one of the earliest exhibitions of photography, which took place in 1839 when British scientist William Henry Fox Talbot presented his photographic prints to the public at King Edward's School in Birmingham. The experience will be fully immersive with visitors walking freely through a digitally reconstructed room. A soundscape for Thresholds will include the sound of demonstrations of the Chartist protesters who rioted in 1839 on the streets of Birmingham, and who can be glimpsed through the digital windows. Alongside the exhibition visitors can view rare archive material from The King Edwards Foundation Archive as well as a series of new works by sculptor and installation artist Cornelia Parker. A White House on Paradise Street by Jo Gane in collaboration with Pete James and Leon Trimble is inspired by the absence of what has been claimed by some writers to be the first photographic image made in Birmingham. It is potentially the first image made in England using the daguerreotype photographic process. Now missing, the image is said to have depicted a White House on Paradise Street, and is thought to have been made by George Shaw in late August or early September 1839. Daguerreotypes are one of the first methods of making a photograph - invented in August 1839 by Louis Daguerre in Paris. It uses a highly polished sheet of silver plated copper, which is made light sensitive by fuming over iodine, then developed with hot mercury before gilding with a gold chloride solution to produce one-off images that appear as if they are a 'mirror' with a memory. In response to research by Pete James, the exhibition places small time machine camera devices around the city in locations relevant to key moments and events in the early history of photography in Birmingham. 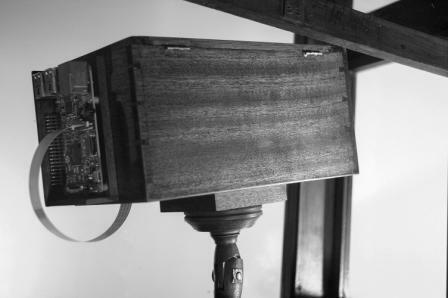 These devices are constructed using historic techniques in mahogany by master cabinetmaker Jamie Hubbard, to resemble the Wolcott daguerreotype camera patented in 1840. Artist Leon Trimble has used Raspberry Pi micro computers to enable them to live stream analogue images from inside the camera back into the gallery space and online. Pete James, Artistic Director for Developed in Birmingham said: "This new season of events and exhibitions celebrates Birmingham's incredible role in the development of photography both in terms of the processes pioneered here through to the first photographs and exhibitions. With the current rise in digital photographs we look forward to working with a range of artists to encourage people to look again both at their city and at how they photograph it." Developed in Birmingham has been made possible by funding from Arts Council England, University of Birmingham, Argentea Gallery and Millennium Point and is supported by BOM (Birmingham Open Media), Birmingham Museum & Art Gallery and neighbouring development, Paradise. Visit www.birminghammuseums.org.uk to book tickets. 40 minute sessions between 10am-6pm. £35 per session. Max 4 people per session. Have your portrait taken using the distinctive Victorian wet plate collodion technique in Tony Richard's pop-up portrait studio. Watch as your picture reveals itself before your eyes to create a one-of-a-kind image that will last many lifetimes. Booking is essential by visiting the Developed in Birmingham website to book. Free. Visit the Developed in Birmingham website to book your place. £5/£3.50. Visit the Developed in Birmingham website to book. This hands-on workshop will offer an insight into the technology behind the Wolcott web cams which form part of the A White House on Paradise Street exhibition. £3. Visit the Developed in Birmingham website to book. £5. Booking essential. Visit the Developed in Birmingham website to book. Hear from some of the artists exhibiting in the current Shadow Merchants exhibition. 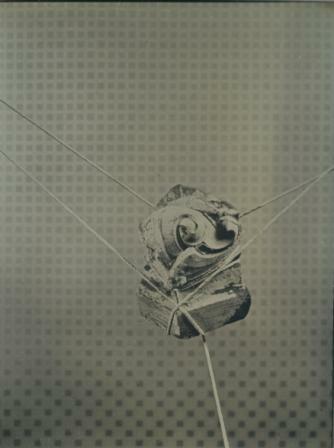 Melanie King, Jo Gane and Gwen Wilkison will give a short talk about their work using historical and alternative photographic processes. Roaming event, meet by the entrance to Town Hall. £10, Visit the Developed in Birmingham website to book. Construct your own simple Wolcott camera, using cardboard, tape and a concave mirror. Meet by the Victoria statue in Victoria Square. Join local photographer and urban designer Philip Singleton on a photo walk around the city centre. Free. Visit the live stream link on the website on the day to view the event. Tune into the camera live streams across the city to reveal some characters from 1840s Birmingham interacting within the contemporary cityscape. £5/£3.50 Visit the Developed in Birmingham website to book. Create a gigantic collaborative cyanotype print with artist Melanie King using a selection of objects and a giant piece of fabric. Look out for Wolcott, our Big Sleuth Bear, hanging around Birmingham Museum & Art Gallery. £5/£3.50, Visit the Developed in Birmingham website to book. A mix of computation and cardboard. From the camera obscura to artificial intelligence, join artist Pete Ashton to build and hack cameras.